Wights Mountain has one of the best preserved Aboriginal Ceremonial Bora Grounds in our area. I didn’t have a wide-angled camera, so I had to stitch the photos together. Can you make out the raised ring of earth? The Bora Grounds consisted of one large ring in which important tribal ceremonies were conducted, and a second secret ring where young initiates were taken to learn “mens business”. The two rings are connected by a sacred pathway approximately 400m long. As I stood by the large ring, I imagined what it would have been like to stand here hundreds of years ago in the firelight as the tribe sang their songs, and young boys became men – learning secrets handed down for generations. I felt a sense of loss. European history is almost clinical. It has been chronicled in books for centuries for anyone to read. Aboriginal history is different. To learn it you needed to have a relationship to the person telling it to you, and a personal commitment to the community. We’ll never know many of the stories and secrets told here – they died with the story tellers. I’ve only photographed the larger ring. I didn’t think it was respectful to photograph the smaller ring. If you want to see that, you’ll need to go to Wights Mountain yourself! 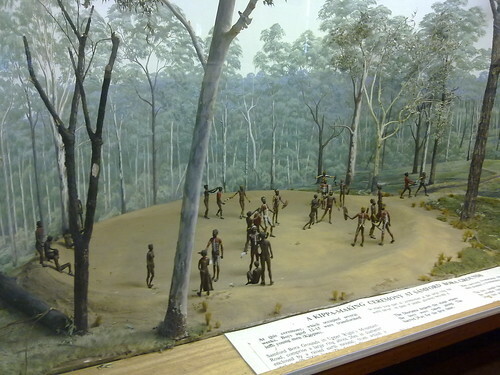 Here’s a diorama at the Samford Historical Museum depicting how the Bora Ring would have been used by the local Aboriginal people. 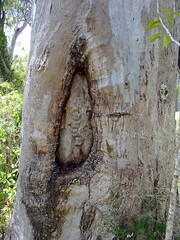 There are several Marked Trees at the Bora Grounds. One of these is obviously a Government Survey Tree (marked with an “R” and a number). I’m not sure whether the other trees are survey trees, or have been “marked” by Aborigines to signify the importance of the site. I’ll update the information when I find out. 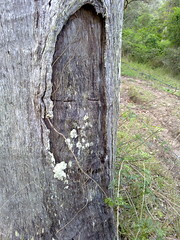 Our local council historian says he believes the markings on this tree are of Aboriginal origin. He says this survey mark was blazed in the 1930’s when the council intended to build a road through the Bora grounds. The Wight family (after whom the area is named) objected to the plans and managed to have the grounds preserved. 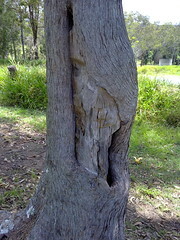 This tree was probably intended to be a survey tree since it is near the boundary of the grounds. Perhaps whoever intended to blaze it abandoned their plans once the course of the planned road was changed? Facintating, thanks for educating me. Love it. Do you also have pics of the Sampson Vale bora ring? There’s a great bora ring near Beewah too, love to go there. For some reason I am always compelled to clap my hands and sing out, introducing myself. Actually, the first time I visited I misread J.G.Steele’s comments and was looking in the wrong spot, so I had to ride back a second time. There’s a couple of photos there, but I’ll need to go back and get a better wide-angled one. BTW You’re doing the right thing clapping your hands and singing out. I’ve read that when approaching an Aboriginal camp you were supposed to call out and let everyone know you were coming. It was bad manners to approach quietly. Where abouts is the Beerwah ring? Hi, just reading your comments on the Samford Bora rings. Many thanks, I’ve been trying to find them for years! The Beerwah one is on Johnstone rd. If coming from the Bruce Highway, left on Johnstone follow about 1-2 kms, & 200 mtres BEFORE Crittendon rd, on your right is a dirt road with a low green national parks sign saying “Bora ring”. (Pine forest on right, cultivation/pineapples on left) Follow about 700 mts round bend, then walk in on left on small path. There is also a great one at Nudgee Waterholes in Brisbane, park in the Nudgee waterholes carpark & picnic area/playground & follow signs along boardwalk about 500 m.
Thanks so much for this valuable info. “Aboriginal Pathways” is a great book. It’s quite rare too. The smaller ring at Wights mountain is at the other end of the reserve, up the hill and around the corner about 800m away. There are a couple of scarred trees near it. Have you ever been to the Bora site on the way to Rainbow Beach? The second time we went there it was much harder to find as some of the access points are no longer visible and/or open. Was a strange feeling being at a place with so much history but not knowing much about it. I didn’t even know about that ring. Where abouts is it? I would love to check it out some time. Thanks Ruth. This is just the info I need.